I’m ‘gonna smear it up! I channeled my grandfather the other day. I primed the old kitchen and bathroom cabinets I have in the garage for storage and was not the most careful. I got paint on garage floor, among other places. When it came to continuing, since I was in the groove I found other things to paint and I primed the old filing cabinets I have. At some point in time, Eberhard Manufacturing, where my grandfather and my mom had both worked, and I think my Uncle Joe as well, got rid of office furniture when I was in high school. I took two filing cabinets and carefully repainted them with Rustoleum paint in blue. I painted the drawer fronts red and white. At some point, I took the drawer fronts to one of them and repainted them light blue to be able to keep them in the house. When we got some Stickley furniture for the office from the Alonzi estate, we put the filing cabinets in the garage. I primed them and unlike the previous times finishing them, I painted around the hardware. I also primed the garage wall cabinets and their doors. 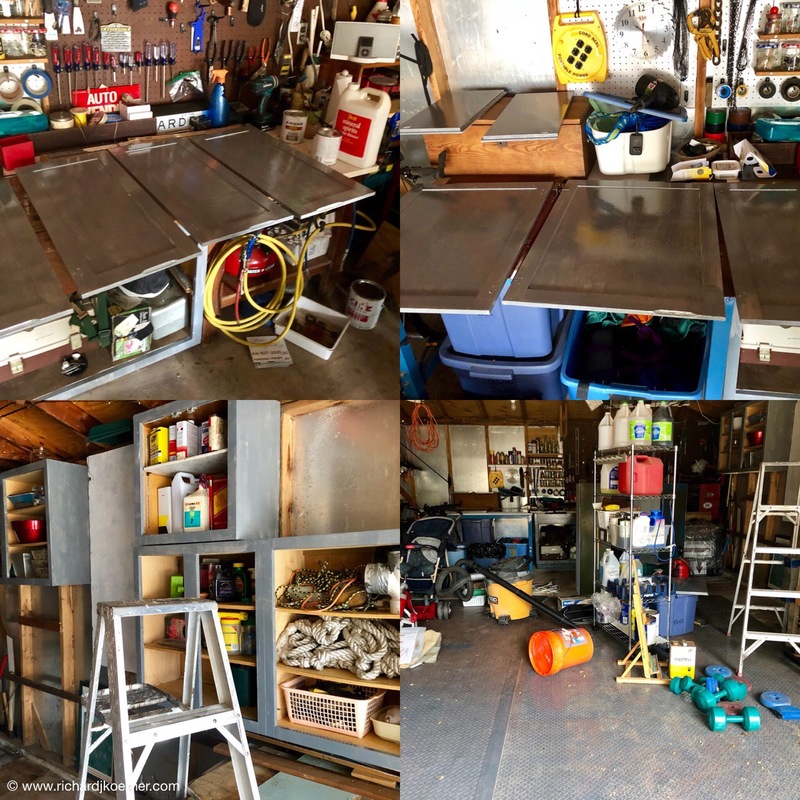 I made the garage organization an absolute shambles. Saturday morning, I painted the wall cabinets and the backs of the doors in oil base, gloss gray. It took me much less time than the original work the day before. Mind you, when I inspected and cleaned the existing wall cabinets I was painting, I found them pulling away from the way. I had some ‘shoring up’ to do. Now I will have to put another coat on and then do the door fronts before repainting the filing cabinets. Then I shall have to put the hardware back on. I am a bit crazy. While doing this, I also threw things out in my efforts at Swedish death cleaning. This entry was posted in Cleaning, Cleanliness, Life in general, Painting, Thoughts and philosophy. Bookmark the permalink.